I love dips. For me there is nothing better than taking a chip, veggie or a piece of bread and smothering it with whatever dip I have come across. I especially love dips that star hot and melty cheese in them. But sometimes I need a break from my melty cheese dips and want something a little bit different. Jim and I stumbled on the combination of feta and roasted red peppers after he had had a similar dip while at a friends party. Jim found a basic recipe online and whipped this up and I was hooked on the combination. After a few tweaks and revisions, we found the below recipe to be our favorite way to make this stellar combination. This dip is amazing served with warm pita bread cut into triangles (you can get pita bread at almost every grocery store, usually by the deli counter) and can be served as an appetizer or a light dinner. We recently paired this dip with seasoned pearl (Israeli) couscous and it was a hearty and filling meatless meal. The best part? This dip only takes 10 minutes from start to finish and you only have to dirty up the food processor to make it. An amazing dip, fast prep and only a few dishes to wash? Sign me up! Serve with warmed pita bread. This recipe can easily be doubled or even tripled if you are feeding a crowd or want leftovers. It tastes even better the next day and requires no warm up to dig in! If you do want to make a large batch of this but have a small food processor, you may want to make a single batch each time and combine all batches into a large bowl to avoid breaking your food processor. 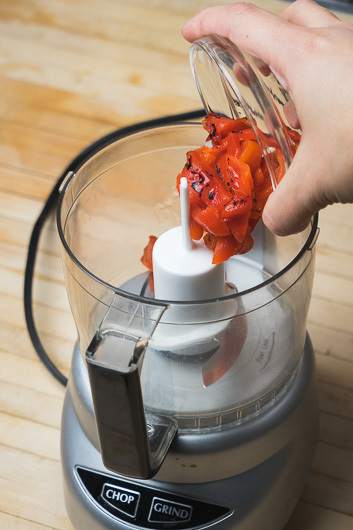 Since you are making the same thing, you won’t even need to wash the food processor in between batches.